Justin Masterson and the Indians are continuing talks about a contract extension. Here’s some good news for the Indians: Justin Masterson will reportedly not be making exorbitant demands as the two parties work toward a new deal. Paul Hoynes of the Northeast Ohio Media Group reports that Masterson and his agent Randy Rowley proposed a three-to four-year deal, allegedly in the ballpark of $40 million to $60 million, to the Indians this weekend. Masterson and the Indians avoided arbitration by coming to a one-year, $9.7625 million agreement on Feb. 18. Talks are continuing and a March 31 deadline has been set for an extension to be signed, Hoynes reports. However, the two are open to prolonging negotiations if they are getting somewhere. CBSSports.com’s Jon Heyman writes that the Indians have exhibited that they do not want to give Masterson a deal similar to the six-year, $105 million extension the Reds’ Homer Bailey received. 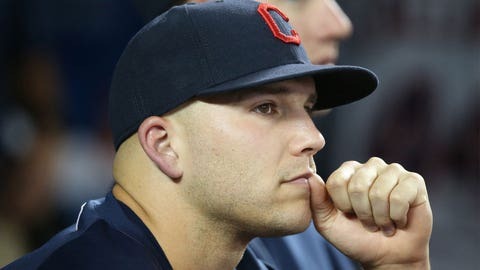 Masterson reportedly enjoys playing for manager Terry Francona, was encouraged by the team’s playoff berth last season and has family in Ohio. The Indians locked up outfielder Michael Brantley to a four-year extension with an option for a fifth-year this offseason. Pitcher Ubaldo Jimenez chose to go to Baltimore for a long-term contract after declining the Indians’ one-year, $14 million qualifying offer. Masterson was an All-Star last season, finishing the year with a 3.45 ERA and 195 strikeouts in 193 innings pitched. Securing the 28-year-old, who has been a lynchpin of the pitching staff, would be huge for long-term stability atop the rotation.